After a succession of rocket burns to fine-tune its pursuit of the International Space Station, the commercial Dragon spacecraft is due for a flyby of the complex Thursday, a crucial prerequisite for the ship's planned arrival at the outpost Friday. Since it launched aboard a Falcon 9 rocket at 3:44 a.m. EDT (0744 GMT) on Tuesday, Dragon has accomplished GPS navigation tests, abort demonstrations, and a test to see if the craft could turn off its control thrusters and enter free drift mode, the condition necessary for the space station's robot arm to reach out and grapple the spacecraft. Dragon also opened the door to the ship's navigation bay, which contains laser rendezvous and thermal imaging sensors, as well as the spacecraft's grapple fixture. SpaceX is testing the Dragon spacecraft to prove its readiness to carry supplies to and from the space station under a $1.6 billion contract with NASA. 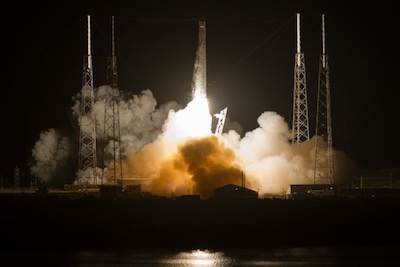 The Falcon 9 rocket injected Dragon into a near-perfect orbit, and the craft's Draco orbital maneuvering thrusters have adjusted its trajectory to reach the space station's vicinity early Thursday. Two burns are planned between 3 a.m. and 4 a.m. EDT (0700 and 0800 GMT) to put Dragon on a path to fly 2.5 kilometers, or about 1.6 miles, beneath the space station some time around 6:30 a.m. EDT (1030 GMT). Thursday's test is called a fly-under by NASA and SpaceX. "The fly-under is very important to us because it's the first time the Dragon and the space station will communicate with each other, an absolute requirement for proximity operations," said Holly Ridings, NASA's lead flight director for the SpaceX demo flight. "It's the first time the crew on-board the ISS will send a command to the Dragon and get a response. This is just a test command, so it's a light on the Dragon, but it's leading towards the crew potentially needing to send more invasive commands, such as a hold, retreat, or even an abort later." The space station crew has a UHF communications panel to issue simple commands to Dragon, and astronauts will order Dragon to switch on an external light during Thursday's close approach. The station astronauts can communicate with Dragon when it passes within 28 kilometers, or about 17 miles, from the orbiting lab. The spacecraft's relative GPS navigation system will also be tested. 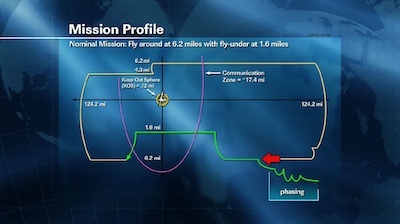 Relative GPS navigation compares the positions of the space station and Dragon, telling the craft's computers its distance and velocity relative to the complex. "We're also gathering navigation data," Ridings said. "The way the two vehicles navigate together is relative, where you get pieces of information from both vehicles, and you do a calculation and then they know exactly where they are in space relative to each other. We're gathering information to make sure that navigation system works." The Dragon will conduct a series of burns after the point of closest approach to fly in front, above, then behind the space station, setting up for another rendezvous early Friday. SpaceX and NASA originally agreed to two Dragon test flights to the space station under the Commercial Orbital Transportation Services program. The COTS initiative aims to focus NASA investments, coupled with private capital, into commercial spacecraft and rockets to resupply the International Space Station. SpaceX's COTS 1 demo flight, a brief orbital mission of a simplified Dragon spacecraft, successfully flew in December 2010. COTS 2 would have featured only the fly-under of the space station to test long-range rendezvous systems, then the COTS 3 mission would have completed a full approach and berthing with the 450-ton complex. But SpaceX asked NASA to combine the COTS 2 and COTS 3 missions, forcing a replan of the Dragon demonstrations. Thursday's flyby would accomplish the rendezvous set of SpaceX's COTS 2 objectives. The COTS 2 goals also include abort demos and testing of Dragon's solar arrays, redundant avionics and computer - all of which have performed well so far. NASA will approve SpaceX's plan of berthing with the space station Friday only after the satisfactory completion of Thursday's flyby. Space station managers plan to meet following Thursday's demonstration to review the results of the tests. If all goes according to plan, officials will give the go-ahead for Dragon to converge on the space station again Friday, this time with clearance to proceed to a point 250 meters, or 820 feet, directly beneath the station. Once close to the station, Dragon will rely on laser and thermal imaging instruments for precise navigation cues as the craft autonomously flies toward the outpost. After another sequence of abort and hold demonstrations commanded from the space station, Dragon will continue flying toward the complex, eventually reaching an imaginary box about 30 feet under the station's pressurized modules. 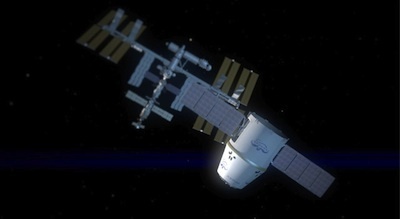 NASA flight engineer Don Pettit will drive the station's robotic arm to grapple Dragon when it is stable at the capture point, then move the craft to a berthing position on the Harmony connecting module. Departure and splashdown of Dragon is expected May 31.